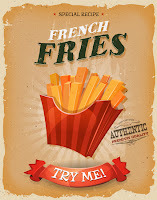 Connecting the World: French fries: Universal food? Are what we, in the US, call French fries a universal food? Read through Afar magazine's article “13 Ways to Eat Fries Around the World” a sampling of how French fries are represented around the world and then decide. We all know that enjoying the local cuisine is a highlight of any voyage. What version of ‘french fries” will you try next? And which one will be your favorite?